Back in 1996 someone told me about the existence of the internet… and, between jobs a year later, I took my first look at the world wide web… having only just struggled to master using a computer to write letters and keep accounts. When I did start to surf around I was amazed by what was out there – nearly a million websites covering a world of wonders from institutions, societies, companies and even individual. But, like most new boys toys I soon found the limitations. There was a plethora of search engines, but none was king and all used different techniques so when I looked for things I wanted, like birding checklists, ID help, local reserves or birding clubs, I realized that the web was in its infancy and the tool I wanted – a neon sign pointing to all things birdy - just didn’t exist. Sure there were a few ‘portmanteau’ sites, but they were almost exclusively American and, bless them, most seemed the think that their state was their country and the ‘rest of the world’ was the other 59 states, somewhere at either end of the universe were dragons called ‘Canada’ and ‘Mexico’! My problem has always been that I just can’t leave things alone… so I began to collect lists of websites that I found useful for some aspect of my birding passion – information about places to bird, UK clubs and ornithology societies and so on. Back then, when I searched for ‘bird clubs’ I’d get different answers from ‘Alta Vista’ than from ‘Lycos’ and from the other dozen search engines, and each would throw up a different set of answers back before we found Yahoo or from 2000 when we all learned to ‘Google’! My lists grew but, apart from sending these to some other birding friends, things went no further until somehow, I can’t even remember how, I was approached by a web developer who was, at the time, creating and managing the websites of one of the UK’s top ten companies. He was bored with the same old stuff and had seen my pleas for help. He said he would create a website for me if I told him what I wanted – and for free! The downside was that it would be done in his time scale not mine. So, in 1999, a full year before Google had indexed more websites than Yahoo I began to put together Fatbirder – a great big signpost on the web pointing to all things related to birding and wild birds. I remember the end of that first week when I looked at the ‘stats’ on the website and found I had had 111 hits! Wow, imagine, 110 peeps at Fatbirder pages, I was overwhelmed with the success. Now Google has penetrated every corner of the wide world, there are hundreds of millions of websites and Fatbirder gets up to 4 million hits a month! Naturally, in over a decade the site has grown immensely. It was a UK site to start with, but soon became world spanning. Then I went deeper into state level in N America and then in many places. I am still adding regional pages – apart from state level for all the large countries from Brazil to China people’s requests need to be met so, for example, countries like France and Spain were split down into regions and latterly I’ve even got pages for individual islands in the Canaries. On request I have visited some areas of the world and created a Fatbirder page for a birding hot spot such as the Rio Grande Valley in Texas… with the trip kindly sponsored by McAllen Chamber of Commerce. This in itself shows not just how the web world has changed. but how much birding has developed too. Back in my youth ‘bird spotting’, whether it was in the UK or US, was seen as something done by a nerdy Billy-no-mates dressed like an overgrown boy scout. Now, in the US alone there are 60 million birders sprouting a 40 billion dollar a year birding industry. So Fatbrider has grown along side it… a few years ago I added pages for every bird family and started listing every bird for each family. Every country now carries an up dated list of that country’s endemics. The latest changes came last year with the format changing so that page sections can be individually scrolled because many were getting so large. The very latest update, just completed, means that every birding hot spot or reserve listed throughout the world has a link to a Google map so you can not only find where it is, but can see a satellite view. Now there are over 2000 pages of information and 30,000 or so links to birding resources. Every day birders from each corner of the planet send me updates or additions. My erstwhile hobby has turned into a 24/7 labour of love, just making sure that all the links are up to date. Birding was always my passion now it seems to have crept into the nooks and crannies of every waking moment… its just as well my wife is a keen birder too! Although, it has to be said that the more Fatbirder has grown the less I seem to be able to get out in the field to see birds! Fatbirder led to Fatfisherman and Fatphotographer - sister websites doing for those pastimes what Fatbirder does for birders. In 2000 I started a charity, then called the ‘disabled birders association’, now known as ‘Birding For All’, to encourage better access for all birders to birding resources. I, as well as other active members, get asked to comment on facilities and big providers like the RSPB routinely consult us when upgrading public facilities. I’ve even had one or two invites to look at reserves overseas. 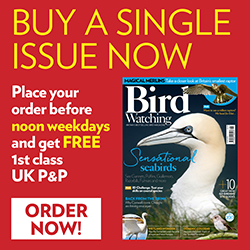 I started writing occasional articles and now have a regular magazine column as the ‘Grumpy Old Birder’ and in 2003 co-wrote ‘Whose Bird’ about people after whom birds have been named… this led to similar more academic works such as the ‘Eponym Dictionary of Mammals’ and the ‘Eponym Dictionary of Reptiles’ published a couple of months ago. Ever since ‘Whose Bird’ was published dealing with common names we have been correcting and expanding it and now have, close to completion, the ‘Eponym Dictionary of Birds’ with every person covered who is commemorated in the name of a bird, common or scientific, genus, species or subspecies. Fatbirder even led me into dipping my toe into the travel business with ‘Anytime Tours’ offering to organize trips for couples or small groups anytime, anywhere and after that ‘Birders Travel’ the first and so far only, true ‘comparison’ website for birding tours – which may well have been re-launched by the time you read this. Through Fatbirder I am ‘e-acquainted’ with literally thousands of birders round the globe from the newby birder asking for ID advice to the great and good of the birding world. Every year at the Bird Fair I get to meet hundreds and hundreds of Fatbirder surfers or Grumpy Old Birder readers and get three days of fame. Its terrific to bask in praise, but I’m very happy for it to be for just three days when I see how the truly famous faces are followed and feted - I’d hate to be even a D-List celebrity! So Fatbirder has not only affected my life as a birder, but my life as a whole. Maybe this article should come with a warning – surfing for birds on the net can seriously change your life!